Dark brown but not black. Huge and complex malty nose with both sweet and roasted elements. Very harsh taste with sharp hops and - I guess - adstringence from the local water. A minor Franconian classic in the limestone Fränkische Schweiz style ("Kalksteinbier"), related to the smoother beers from Pottenstein. 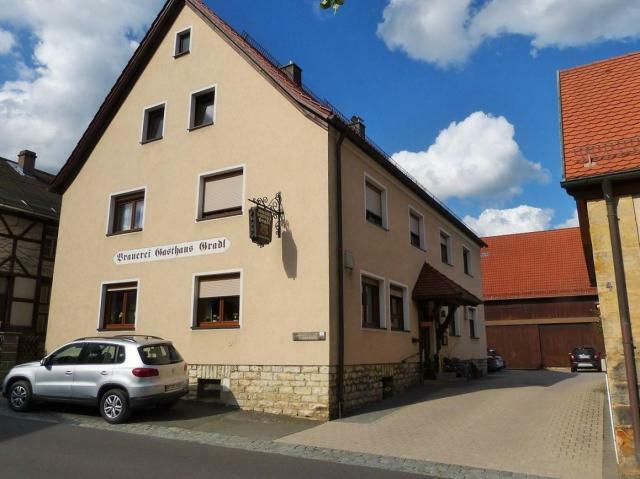 Easy to reach off the autobahn, this small brewery is well worth a visit for its deliciously hoppy Dunkel. A simple 70's tap room is hosted by family members. Lovely rural brewery, visited courtesy of Juergen. Very friendly atmosphere and excellent dunkel beer. Highly recommended but a bit tricky to get to. The best beer in Franconia. And easy to reach by bus, especially if you can speak German. Which number is lowest 57 or 30?